Contribute to the Annual Toys for Tots Drive! 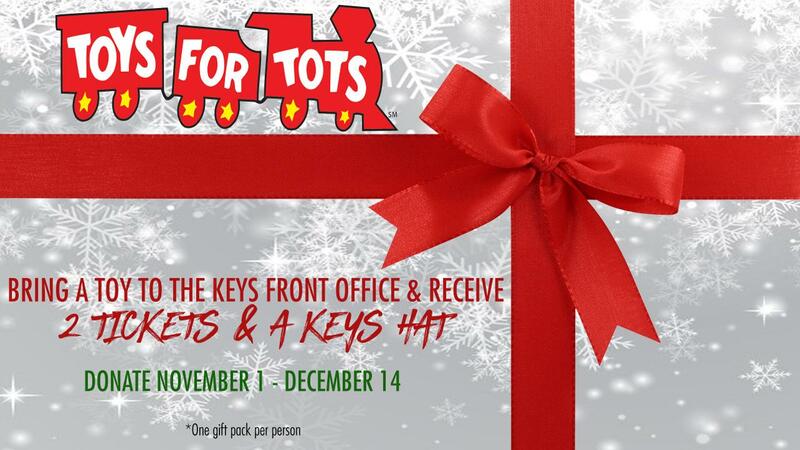 FREDERICK, MD-The Frederick Keys are excited to announce their continued partnership with the Toys for Tots Program. Entering the seventh straight year where the Keys and Toys for Tots have worked together, fans are encouraged to donate new, unwrapped toys in November and December. These gifts are then handed out to less fortunate children on Christmas Day. "It is important that the holiday season is a special time for local children," said Keys Director of Marketing, Erin Lawson. "We've been impressed at the community's support each year and we can't wait for another great turnout in 2018." The collection period for Toys for Tots is underway and runs through Friday, December 14. To make a donation, fans can visit the Nymeo Field main office (adjacent to the stadium main gates) during normal business hours (9 a.m.-5 p.m.) Monday-Friday. Anyone who contributes a new, unwrapped toy receives a Keys hat and two tickets to a game in 2019. Fans can also bring toys to the annual Keys Holiday Event on Saturday, December 1 which runs from 10 a.m-1 p.m. Prize packs will be limited to one per person. Nymeo Field has frequently been one of the top collection sites in Frederick County. A program that began in 1947, there are more than 150 Marine reserve sites as wells as more than 800 local Toys for Tots programs across the country. In 2016 nearly 50,000 toys were collected in Frederick County and almost $30,000 was raised.